You're right... now that I've read this whole paragraph, I cannot possibly unread it. 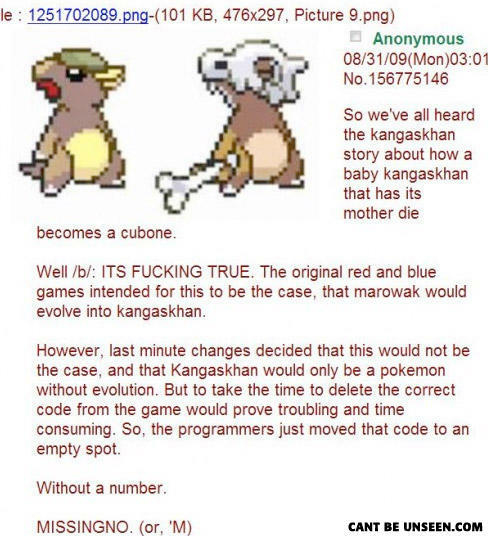 If you had a boy marowak and a girl marowak in the daycare and they have an egg why does the cubone still have a skull if its mom is still alive? in lavender-town, wasnt there some story about a cubone who lost its mother? poster on 4chan is retard. there is more than 1 missingno. go look at glitchcity.info/biglist.htm there are MANY missingnos, and different types, like (pixel block) 'm (pixel block) (referred to as missing M) 'q, etc. Are you a dinosaur? Because you look like you got hit by an asteroid.